Nancy Meade received the "Recycling is Fundamental" award. Mary Ellen Potucek, on-site manager of the Robert Cole Senior Housing Complex of Chester Borough, was given the "Golden Age Recycler" award. Arthur J. Gallagher & Co., located in Whippany, received an award entitled "Insuring a Better Tomorrow by Caring about Today." Rob Grow, the owner of Potbelly's Riverside Café, located on Main St. in Rockaway Borough, received the "Rockaway River Clean Water Stewardship" Award. Rosemary Schmidt was presented her with the "Leading by Example" Award. Earth Friendly Products received the "Recycling Naturally" Award. The Woman's Club of Morristown was honored with the "Supporting Sustainability" Award for their fourth annual Bra Drive. En Pointe with Reuse, Amanda Bloom, Founder of "A Chance To Dance"
Morris County Municipal Utilities Authority (MCMUA) Receives the 2013 Educational Program Award From the New Jersey Department of Environmental Protection (NJDEP) At the 33rd Annual Recycling Symposium & Luncheon sponsored by the Association of New Jersey Recyclers on October 16, 2013, the MCMUA received the 2013 Educational Program Award from the NJDEP. The award was given for the 25 recycling awards dinners hosted by the MCMUA, the first having occurred in 1988. The purpose of the dinners was to honor individuals, businesses, municipalities, social and civic organizations, schools, houses of worship, and others who have been exceptionally involved in projects involving waste prevention, reuse, recycling, composting, and litter abatement. In the photo above, Penny Jones, Morris County recycling education specialist, accepts the award from Guy Watson, chief of the NJDEP Bureau of Recycling & Planning. Fred Wilson, Operations Manager of the Morris County Municipal Utilities Authority's curbside recycling department, was presented an award by the New Jersey Clean Communities Council at their annual awards banquet in Jersey City. In addition to supervising the day-to-day operations of the MCMUA curbside recycling collection program, Fred also oversees road cleanups along county roadways and is directly responsible for having 93 miles of roads cleaned over the last 14 months. The MCMUA is proud of Fred’s accomplishments and we congratulate him on a job very well done! The Hy Nadel Creativity Award - Theodore Largman, Ph.D.
RXcycling Award – Bayer HealthCare Pharmaceuticals, Inc. Recycling – One Can Award ReCommunity Recycling, Inc.
GE-Aviation Systems, LLC, Hanover Township; Building for a “Greener” Tomorrow Award– Homeless Solutions, Inc., Morristown. In addition the dinner commemorated Seven “Stars” who have retired from or moved on from the municipal recycling arena within the past five years:Barbara Bate, Chatham Borough; Hal Bermingham, Morris Plains; Joe Giordano, Morris Township; Jasmine Lim, Parsippany-Troy Hills and Montville; Joe Lowell, Denville; Penny Newell, Mendham Township; Gino Recksiek, Jefferson. Nov. 7, 2008 - 21st Annual Recycling Awards Dinner - The Golden Age of Recycling - Awards include: Counseling for the Plan-It Award – Ron Kevitz; Recycling is Neat! Award – Mark Lavery and Ron Matusiak; Living for the Past, “Levin” for the Future – Carie Levin; Renew and Recycle Award – Don Theriault; Grinding Trash to a Halt Award - Martin Brooks; “N.E.” Morris County Conservation is Good Conservation Award – Kinnelon Conserves; Teaching, Preaching and Reaching for Recycling – Marge Wentworth; The “Write” Angle on the Environment Award – Pam Altman; Working Toward a Greener Future Award – Park Lake School; Collective Wisdom Award – Morris Knolls High School Ecology Club; Presentation of the Maraziti, Falcon & Healey Environmental Excellence Scholarship to Cynthia Onorevele, President of the Morris Knolls High School Ecology Club; Recycling – It’s Academic! Award – Christine Farias, Ph.D; Savings The Earth Can Bank On Award – PNC Bank, Rockaway Townsquare; Global “Worming” Award – TerraCycle, Inc.; Recycling flies high on the golden anniversary of the MCMUA. In addition, this dinner commemorated the MCMUA's 50th anniversary. Click here to read about the dinner and the awards recipients. Nov. 2, 2007 - 20th Annual Recycling Awards Dinner - One Score For Recycling. Awards include: Campaigning for Clean Communities Award – Michelle Guacci; Leaving a Green Path in His Wake Award – Frank Soriano; Dressing Denville for Success Award – Kathy Zuzock; The Green “Gardner” Award – Adam Gardner; All’s Green on the Western Front Award – Mendham Borough Environmental Commission, Mendham Township Environmental Commission, and Mendham Junior Women’s Club; It’s in the Bag Award – Mount Olive Solid Waste Advisory Committee; ReStoring Faith in Reuse Award – Morris Habitat for Humanity; Responsible is as Responsible Does Award – Matt Myers; Whole Foods, Whole Picture Award – Whole Foods Market, Madison, NJ; Go Green, Go Army! Award – U.S. Army Garrison, Picatinny Arsenal; Providing the Foundation for Recycling in NJ Award – The Honorable Thomas H. Kean, The Honorable Paul Contillo, and The Honorable Arthur Albohn. Click here to read about the dinner and the awards recipients. Nov. 3, 2006 - 19th Annual Recycling Awards Dinner - Recycling - Plan It. Awards include: The Morris County North Star – Gino Recksiek; Spokesman for the Planet – Bruce Hoppe and Robert Young; Vim, Vigor and “Vidality” – Christine Vidal; Schleicher – You Gotta Like Her! – Judy Schleicher; She’s “Scout” of This World – Mary-Ann Lewis, Morris Area Girl Scout Council; Head to Toe Conservation – Woman’s Club of Denville; Plan It, Pick It, Pack It – Cub Scout Pack 249, Budd Lake; It’s “S’cool” to Recycle – Delphine Slotten; Persistence is a Virtue – Mary Fischetti; No Recyclables Left Behind – A foursome from Riverview School in Denville: Diane Burton, Mary Ellen Coiro, Kris Johnson, Paul Kruger; Keeping the Effervescence in Recycling – Michael E. Degen, Cadbury Schweppes Science & Technology Center. Click here to read about the dinner and the awards recipients. Nov. 4, 2005 - 18th Annual Recycling Awards Dinner - The Faces of Recycling. Awards include Ronald McCycle – Catherine Belotti, the Montville Township Women’s Club; Joe to the Rescue – Joe Cuva, Madison; Scouts’ Honor – Boonton Twp. Boy Scout Troop 69; She said, "Let there be recycling!" – Andrea Bent, Suzanne Koerner, Jean Mattle and Joanne Sternberg; "I can’t believe we’re not recycling!" – Barbara Miller, Morris County Office of Temporary Assistance; Sue. Me for Caring – Suzanne Mc Cluskey, Morris Plains; "I scream for D. Madison and Heath Bar Crunch!" – Dolores Madison and Kathy Heath, Randolph; "Make the world a better place" – Morris Area Girl Scout Council; Shop Right, Recycle Right – Christopher Kenny, Morris County School of Technology; Taking the Lead – The Willow School, Gladstone; Moving in the Right Direction – AAA New Jersey Automobile Club; Victoria’s Victory – Victoria Forte, Denville; and A Green Pill for Mother Nature – Pfizer Inc., Morris Plains. Nov. 5, 2004 - 17th Annual Recycling Awards Dinner - The Sounds of Recycling. Awards included the Styro-Gyro Award – Jaclyn Vanderhoof, Randolph; D. Queen Bee Award – Donna Bangiola, Morristown; It’s Scout of This World Award – Boy Scout Troop 173, Parsippany; Roads Scholar Awards – Hank Muller and Bob Riker, Denville; Testa-ment to Recycling Award – Jerry Testa, Long Hill; Eye of the Tiger Award Award – Rocky Metzger, Jefferson; Recyclers’ Watchdog Award – Russell Santos, Mt. Arlington; Vivace Recycling Coordinator Award – Patty DiCenzo, Boonton Township; Subtracting the Waste - Making a Difference Award – Mary Ann Lynn, Montville; Pedaling Soles Award – Denville Recycling Staff, Denville, A Sharp Crew Award – Chatham Borough Environmental Commission; “Why pay?” Award – The Lake Road Irregulars; Whispering Success Award – The Quiet Man Irish Pub, Dover; Saving Motherboard Earth Award – Intel, Parsippany; and Cops and Recyclers Award – Sheriff’s Labor Assistance Program. 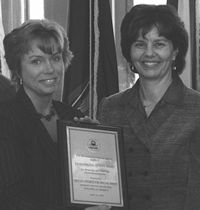 Thurs., May 20, 2004 - Liz Sweedy was honored at the first New Jersey Clean Communities Awards Banquet held in New Brunswick. She received a New Jersey Clean Communities Education Award. Below is what was read when Liz received the award. With Litter clinging to her sweater, Liz Sweedy, Morris County Clean Communities Coordinator, visits a classroom to tell the students why they shouldn't litter. She reads the book The Wartville Wizard and shows slides from the book. She introduces them to her puppets and tells them about storm drains and how litter travels through them and how plastic wrap looks like a jellyfish in the water and is eaten by fish. Liz Sweedy has given 45 of these small classroom presentations this spring to over 900 elementary school students. In addition, she contracts with several educational presenters who also educate in the Morris County schools, usually in an assembly type format to all ages of students. 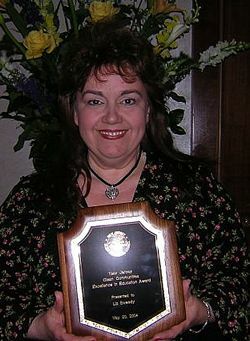 Tues., May 11, 2004 - Our very own Penny Jones, recycling education specialist for the MCMUA, was honored on May 11, 2004 with the "Quality of Life" award from Morris Tomorrow presented for her vision, effort and enthusiasm. This is Morris Tomorrow's 15th Annual Awards Breakfast at which they chose three Community Leaders to honor from Morris County. Penny was featured in the Morris News Bee, the Echoes-Sentinel, the Bernardsville News and the Observer Tribune on March 11. Click here to read the full article which appeared in the Morris News Bee. Nov. 7, 2003 - 16th Annual Recycling Awards Dinner - Recycling is a Ball. Awards included: Recycled “Gingerbread” Is Delectable - Ricky Boscarino, Luna Parc, Montague; A Pocketful Of Litter - Jordan Matelsky, Roxbury Township; Energetic Enforcer - Kathleen O’Neill Margiotta, Morristown; Extra Mile For The Environment Award – Louis Troiano, Onyx Waste Services, Inc.; “On The Ball” Recycling Coordinator – Eileen Hladky, Chatham Township; Caring for Planet Earth Award – Cedar Hill Tools For Schools For Kids Committee, Montville; Excellence In Environmental Education Award – Environmental Commission, Hanover Township; “How Does Your Garden Grow?” Award – Mount Olive Middle School Environmental Club, Mount Olive Township and more. Click here to read about the dinner and the awards recipients. 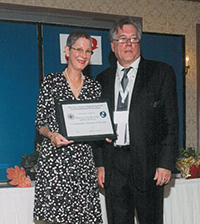 Oct. 15, 2003 - The Association of New Jersey Recyclers (ANJR) bestowed the 2003 REX (Recycling Excellence) Award on Morris County District Recycling Coordinator Kathleen Hourihan at “Drive Home Recycling,” the 23rd Annual Recycling Symposium and Luncheon. Sponsors of “Drive Home Recycling” were ANJR; the New Jersey Department of Environmental Protection, Division of Solid and Hazardous Waste, and; the New Jersey Recycling Forum. The REX Award has been presented annually since 1994 to an active ANJR member who is well-versed on the issues of recycling and solid waste and who promotes ANJR goals through action and advocacy. A 1990 honors graduate of Cook College in New Brunswick, New Jersey, Kathleen holds a B.S. degree in environmental science. In November 1993 she completed the first New Jersey Recycling Certification Series program offered by the Cook College Office of Continuing Professional Education. In June 1993 Kathleen began working at the Morris County Municipal Utilities Authority (MCMUA) as an assistant recycling specialist, and in August 1998 she became the Morris County district recycling coordinator. For several years she has served on the ANJR Board of Directors where she has been involved in several projects including overseeing the publishing of Beyond the Curb…, the ANJR newsletter. Kathleen, a Morris Plains resident and a member of the Morris Plains Recycling Committee, is also a Morris Habitat for Humanity volunteer who served on its board for six years. As a Habitat Board member, she was secretary of the board and then chair of the public relations council. During summer 2003 she spent a week in Anniston, Alabama, working on construction projects. Former President Jimmy Carter, who was also volunteering at the Anniston project, was photographed with Kathleen. “She’s a first when it comes to being passionate about waste prevention and recycling,” Dennis added. Joining Kathleen at the awards ceremony were several of her MCMUA colleagues, as well as MCMUA Chairman James Barry, and Kathleen’s parents, Bernadette and Joseph Hourihan of Cedar Grove, New Jersey. Apr. 24, 2003 - EPA Environmental Quality Award for Special Efforts for Special Waste. The MCMUA was presented with an Environmental Quality Award for its outstanding commitment to protecting and enhancing environmental quality through its sponsorship of its special and hazardous waste management programs. The Environmental Quality Awards are the highest recognition presented to the public by the USEPA. Awards recipients come from all sectors of the community, including non-profit, environmental and community groups, individual citizens, environmental education and business organizations and members of the news media. In the photograph are Laura Macpherson, MCMUA Hazardous Waste Coordinator accepting the award from Jane M. Kenny, USEPA Region 2 Regional Administrator (photo by Robin Holland). November 1, 2002 - 15th Annual Recycling Awards Dinner. - The dinner's theme was "Homeland Recycling . . . Winning the War On Waste" The MCMUA honored individuals, businesses, educational institutions, civic and religious organizations as well as municipalities that have made significant contributions in the realm of waste and/or litter prevention, reuse and recycling. Nov. 2, 2001 - 14th Annual Recycling Awards Dinner. The dinner's theme was the "Business of Recycling." 2001 NAHMMA Program Excellence Award for Hazardous Waste Management -- In 2001, the MCMUA received a Program Excellence Award at the 16th Annual Hazardous Materials Management Conference in Portland, Oregon, for its outstanding hazardous waste management program. Sponsored by the North American Hazardous Materials Management Association (NAHMMA), this conference recognized and promoted exemplary pollution prevention initiatives. Nov. 1, 2000 - 13th Annual Recycling Awards Dinner. November 5, 1999 - 12th Annual Recycling Awards Dinner. The dinner's theme was "The Art of Recycling." Oct. 21, 1999 - The MCMUA has been selected to receive the 1999 SWANA Special Waste Management Silver Award. The SWANA Special Waste Management Excellence Award is presented annually to (1) recognize outstanding performance in operation, design, efficiency and an overall integrated solid waste management system, and (2) promote excellence to the general public. 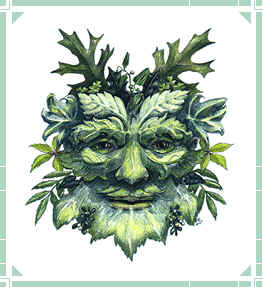 The MCMUA has been continually updating its special waste management programs to reflect the most current and progressive management techniques and has been consistently dedicating increasing amounts of time, money and effort into fostering their self-sustainability. Specific components of the MCMUA’s hazardous and special waste management programs include: (1) household hazardous waste management, which includes four household hazardous waste cleanup days, a year-round permanent household hazardous waste facility, household hazardous waste identification residential visits, and a battery recycling program; (2) universal waste recycling, which collects essentially hazardous waste items such as fluorescent light bulbs, ballasts, mercury switches and thermostats for recycling; (3) a materials exchange program which matches non-profit organizations with donors of unwanted office furniture and equipment, thereby diverting usable items from the landfill; (4) a tire collection program which collects used tires for recycling; and (5) a vegetative waste composting program which turns vegetative waste, including leaves, grass and brush, into marketable products, such as wood chips and mulch. Nov. 6, 1998 - 11th Annual Annual Recycling Awards Dinner - Recycling and You, Perfect Together. Sept. 29, 1998 - The MCMUA received the 1998 County Award for Outstanding Achievement in Recycling. This award is presented to only one New Jersey County per year and is sponsored by the NJDEP, ANJR and N.J. Recycling Forum. The award ceremony took place at the Princeton Marriott and the award was presented by the NJDEP Commisoner Robert Shinn to Morris County Freeholder Director Druetzler, Morris County Freeholder Solid Waste Liaison Bramhall and Morris County District Recycling Coordinator, Kathleen Pelak . Morris County's comprehensive recycling program is one of the most successful in the Country. It has achieved the New Jersey's 50% municipal recycling goal as well as its 60% overall recycling goal. In addition, the Morris County's recycling program reaches into the business community and also handles non-traditional recyclables such as fluorescent light bulbs, ballasts, batteries and more. While individual staff members have received awards in the past, the MCMUA is especially honored to receive this prestigious state-wide county recycling program award. Sept. 30, 1997 - At the 1997 Annual Recycling Symposium & Awards Luncheon, sponsored by the New Jersey Recycling Forum and the Association of New Jersey Recyclers, MCMUA education specialist, Penny Jones was presented with the prestigious REX (Recycling Excellence) Award. Apr. 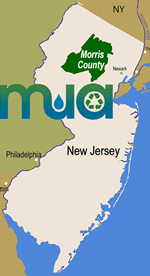 23, 1997 - The New Jersey Department of Environmental Protection issues the MCMUA a certificate of appreciation for the 10th anniversary celebration of the New Jersey Mandatory Source Separation and Recycling Act organized by the MCMUA. Mar. 3, 1997 - The Whippany Watershed Stewardship Award is presented to the MCMUA with appreciation by the Whippany Watershed Partnership in cooperation with the New Jersey Department of Environmental Protection. 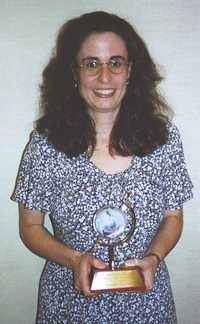 May 20, 1995 - The Morris County Chapter of the Arc presents the "Employer of the Year Award" to the MCMUA. Nov. 1, 1995 - 8th Annual Recycling Awards Dinner, Hanover Manor, East Hanover, NJ - The Wheel is turning and you can't slow down; you can't let go and you can't move on; you can't go back and you can't stand still; if the thunder don't get you then the lightning will. Oct. 28, 1993 - The Occupational Training Center of Morris County presents the MCMUA with a "Work Services Award" in recognition of advancing work opportunities for individuals with disabilities through recycling programs. Oct. 20, 1993 - 6th Annual Recycling Awards Dinner, Hanover Manor, East Hanover, NJ - Morris County honors those recyclers who have . . . "Put Their Best Foot Forward!" 1990 - The National Association of Counties presented Morris County, New Jersey the 1990 County Achievement Award for its "Glinda Garbahj" recycling program. This award was given to Morris County in recognition of distinguished and continued contributions to the cause of strong and efficient County Government in the United Stated of America. 1989 - The National Association of Counties presented Morris County, New Jersey the 1989 County Achievement Award for its mandatory recycling program. This award was given to Morris County in recognition of distinguished and continued contributions to the cause of strong and efficient County Government in the United Stated of America. Nov. 21, 1988 - 1st Annual Recycling Awards Dinner.